Medical terminology can be confusing for patients and even for doctors in training. 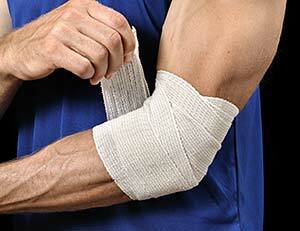 In medical school we are taught that an elbow or shoulder sprain is a “tendinitis”. Unless physicians go onto a specialty concentrating on the musculoskeletal system, it is very likely they will continue to diagnose a shoulder “bursitis” or “tendinitis”. Some of these diagnoses are sound, however they happen only in a small minority of cases. Most of the time, problems such as “tennis elbow” and “shoulder bursitis” are overuse problems, and we use the terminology “itis” to actually imply that the condition is acute, or new. The more accurate terminology describing the underlying problems associated with tennis elbow or shoulder bursitis is tendinosis, which describes a state of micro-tears, disrepair, weakening and what physicians call the “disorganized architecture” of the tendon or ligament. In the early 1980’s, an Orthopedist at Georgetown University, Robert P. Nirschl MD, first described the concept of tendinosis by taking tissue samples from patients who had surgery for tennis elbow. The study results of these injured soft tissues of the lateral elbow revealed a state of disrepair of the tendon, and contrary to conventional thinking of the time, showed an absence of inflammatory cells. Thus, a new idea was introduced to the medical profession: tennis elbow and other conditions like it are not truly inflammatory problems and subsequently, the use of anti-inflammatory injection therapies for such ailments has no lasting positive effect. Of course, they provide temporary relief but do not offer a long-term solution, and medical studies have proven this over and over again. A case in point is a medical review in the November, 2010 issue of the British medical journal Lancet, that looked into the safety and efficacy of corticosteroid injections for various musculoskeletal conditions such as tennis elbow. Little evidence was found that supported such treatment beyond some temporary pain relief. So, what does this all mean for patients? I often explain to patients that tendons and ligaments are like ropes. When the rope is strong, it is compact and tight. When the rope is weakened, over-used and causes pain, it has become thickened and frayed. Physicians can also see this concept on ultrasound of the various tendons and ligaments, and with this tool are able to provide a more accurate diagnosis. In the majority of these tendinosis cases, an anti-inflammatory injection therapy might be offered to help someone only to help them get back to work, for example, in a very short time. However, pain will undoubtedly begin to resurface, and patients are back to square one. Therefore, a long-term solution would include other therapies such as the combination of prolotherapy, OMM, and regular physical therapy. My professional advice? Make sure your physician knows the distinction between tendonitis and tendinosis. A more acurate diagnosis of your condition will certainly help you get the best therapy methods available, ones that will support a long-lasting recovery.